A few months ago I had, what I thought, was a simple question that I posted to Twitter. What surprised me wasn’t the joint confusion around this question, but instead was the number of inaccurate responses I received. The primary reason for the confusion is that there’s an often un-talked about abstraction layer between JSX and what’s actually going on in React land. To answer this question, we need to take a deep dive into that abstraction. In order to create our object representation of a DOM node (aka a React element), we can use React’s createElement method. createElement takes in three arguments. The first is a tag name string (div, span, etc), the second is any attributes you want the element to have, the third is the contents or the children of the element, in this case, the text “Login”. The createElement invocation above is going to return an object that looks like this. What’s interesting about learning React is that typically the first thing you’re taught are components. “Components are the building blocks of React”. Notice, however, that we started this post with elements. The reason for this is because once you understand elements, understanding components is a smooth transition. A component is a function or a Class which optionally accepts input and returns a React element. By definition, we have a Button component which accepts an onLogin input and returns a React element. One thing to note is that our Button component receives an onLogin method as its prop. To pass that along to our object representation of the DOM, we pass it along as the second argument to createElement, just as we did our id attribute. Up until this point we’ve only covered creating React elements with the type property of native HTML elements (span, div, etc), but you can also pass in other React components to the first argument of createElement. However, unlike with an HTML tag name, if React sees a class or a function as the first argument, it will then check to see what element it renders, given the corresponding props. React will continue to do this until there are no more createElement invocations which have a class or a function as their first argument. Let’s take a look at this in action. This whole process is called reconciliation in React and it’s triggered every time setState or ReactDOM.render is called. At this point, we have all the knowledge we need to answer this question except for one crucial piece. Odds are, if you’ve been using React for any amount of time, you don’t use React.createElement to create your object representations of the DOM. Instead, you’re probably using JSX. Earlier I wrote, “The primary reason for the confusion is that there’s an often un-talked about abstraction layer between JSX and what’s actually going on in React land”. This abstraction layer is that JSX is always going to get compiled to React.createElement invocations (typically) via Babel. is the result of this JSX being compiled. 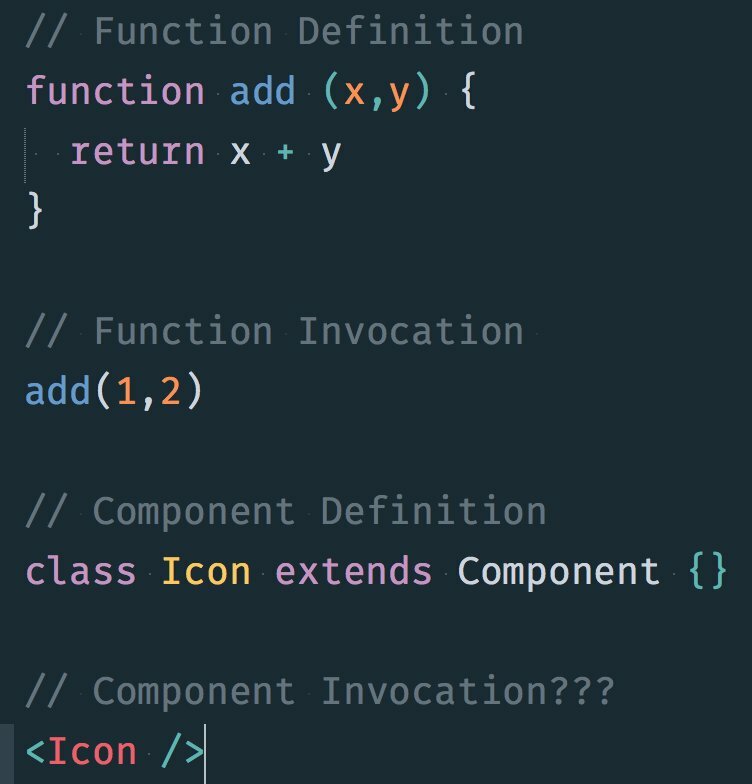 So finally, what do we call it when we write out our component like this, <Icon/>? We can call it “creating an element” because after the JSX is compiled, that’s exactly what’s happening. All of these examples are “creating a React element”.